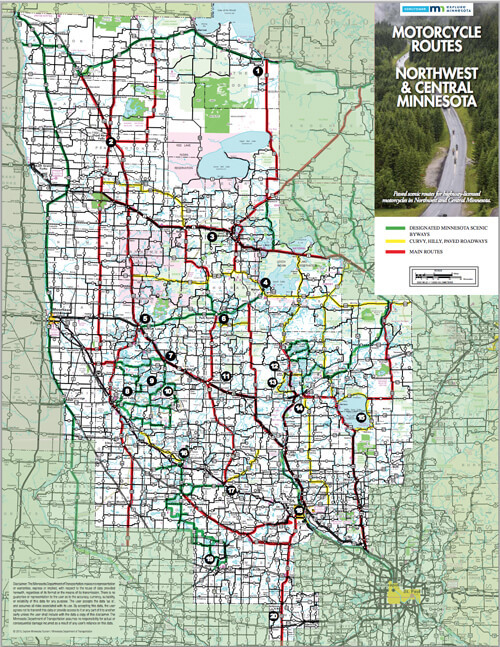 If you would like to know where to fish on Lake Mille Lacs, snowmobile, hike, bike, cross country ski – or how you can get here – check our various maps. Start planning your Minnesota family vacation to the area today! Of all the large northern Minnesota lakes, Lake Mille Lacs is the easiest to reach from the Twin Cities of Minneapolis and St. Paul or from the Twin Ports of Duluth and Superior. Highway 65 and 169 will bring you to Lake Mille Lacs in less than 2 hours from the Twin Cities. The trip from the Twin Ports is approximately 80 miles. The time you save by choosing Lake Mille Lacs means more time on the lake, less on the road. While the proximity of Mille Lacs to these major cities makes it convenient for weekend outings and mini-vacations, the variety of activities available year round make it the perfect choice for Minnesota family vacations of any length. 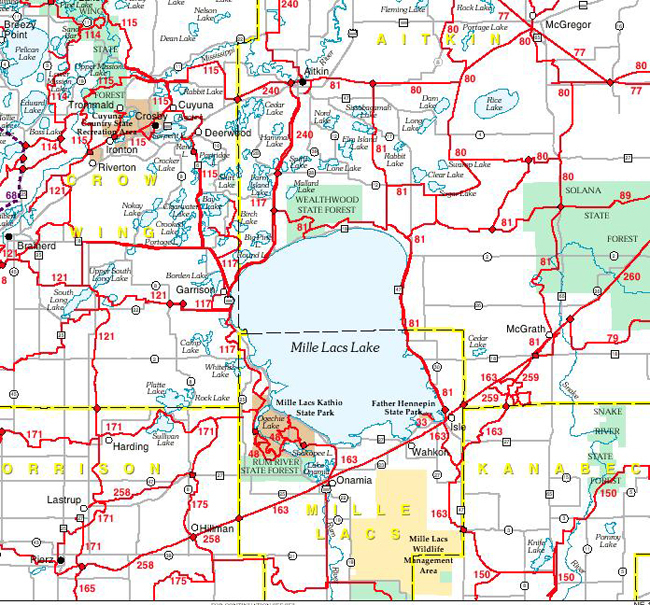 Map Courtesy of King Tutt’s Mille Lacs Lake Walleye Whiffer Map. The maps shown are only a representation of what is on the Walleye Whiffer Map. The actual, to scale, map provides all GPS coordinates, depths, contours and more. Enjoy the finest Minnesota bike trails and hiking in the Lake Mille Lacs MN Lake area State Parks or Wildlife Management areas. Bike the Soo Line trail which is a paved off-road trail in the old Soo Line railroad corridor between Isle and Onamia and extends 11 miles one way. Travel a distance of 18-22 miles from Father Hennepin State Park in Isle to Kathio State Park in Onamia which involves riding on the paved trail and some low volume highway travel. Come experience the Mille Lacs Soo Line Trail for yourself! The Lake Mille Lacs area offers Minnesota ATV trails for beginners to experts. Go solo or with a group and enjoy the longest ATV trail in Minnesota as the Soo Line leads you to the recently completed Red Top ATV Trail, the challenging Ten Bruin Adventure Trail and the Solana State Forest. Trails are open April 1 – November 1 – specific trails may open on different dates so check before you ride. The Garrison Commercial Club, Mille Lacs Drift Skippers, Mille Lacs Trails and EC Riders Snowmobile Clubs maintain snowmobile trails around Lake Mille Lacs and surrounding areas. Pick up your current maps at local area businesses. These are just a sample of the area snowmobile trails. Father Hennepin State Park trails are located in Mille Lacs County on the southeast shore of Lake Mille Lacs. Mille Lacs Kathio State Park trails are approximately 80 miles north of the Minneapolis/St.Paul metropolitan area. The main park entrance is one mile off U.S. Highway 169 on County Road 26. Need a place to get your toes wet and cool off on a hot summer’s day? 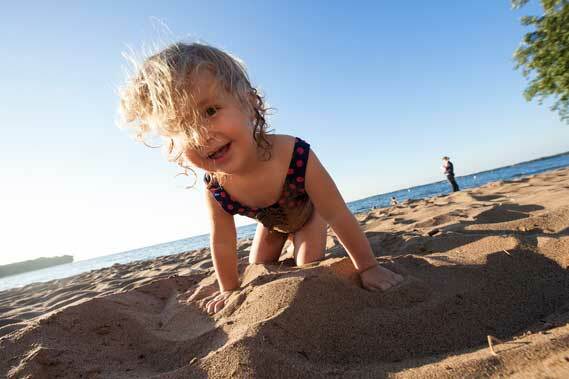 Visit one of our public beaches at Lake Mille Lcas for some fun in the sun at your next Minnesota family vacation! Click on the swimmer icon for details. On your way up with boat in tow? Lake Mille Lacs MN offers numerous public boat accesses around the lake from North to South – East to West. Click on the marker to see Public Access information. 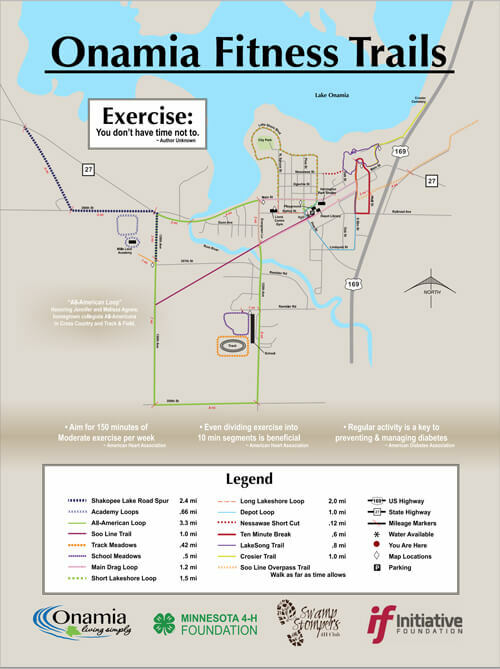 Select your Lake Mille Lacs community Main Street Map. Here you will find approximate locations of Main Street businesses with link to member websites. *Locations are approximate and businesses may change.